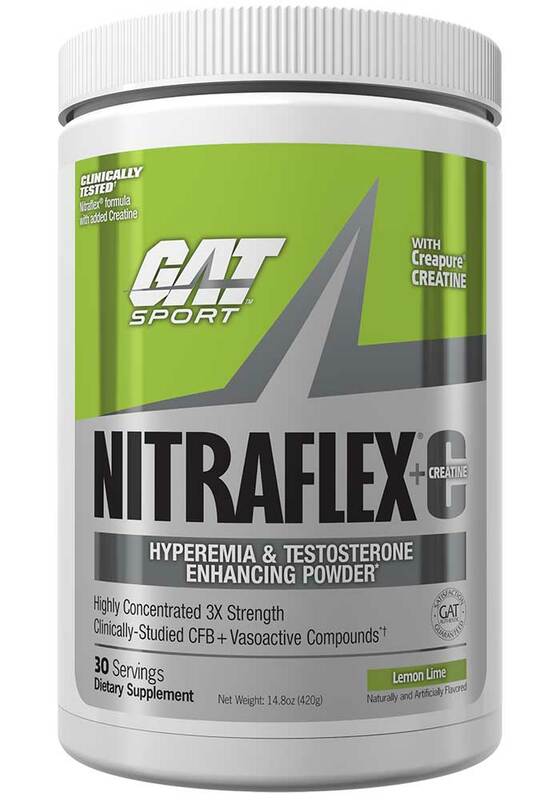 GAT Nitraflex + C provides all the benefits of standard GAT Nitraflex, but with the added benefit of Creatine. GAT Nitraflex + C contains two grams of creatine monohydrate—as CreapureR—to boost muscle phosphocreatine levels throughout your training session. Creatine, found within the muscle as phosphocreatine, is the body's natural ATP (energy) regenerator, particularly for exercises involving explosive strength and power. Research suggests that creatine is especially of benefit for exercises lasting up to 3 minutes1. It makes sense to take creatine around training time, as during training stores of phosphocreatine are "used up" in order to restore ATP. This makes GAT Nitraflex + C an essential pre-workout for anyone wanting to take the next step in their training. Who wouldn't want more explosive strength and power?! GAT Nitraflex + C contains Citrulline and Arginine, which provide the body with basic building blocks required to synthesise Nitric Oxide. Nitric Oxide is actually a gas produced in the body which signals the smooth muscles of the blood vessels to relax. This vascular relaxation increases the diameter of the blood vessels, allowing more blood to flow to the extremities and also to skeletal muscle tissue. And guess what ... along with blood comes nutrients, like oxygen, glucose and amino acids. This increased delivery of nutrients to the muscle tissue during training will support activity of the muscle and also improve the muscle "pump" experienced. Citrulline has the ability to elevate blood arginine levels quite rapidly, as arginine is the direct building block or precursor to Nitric Oxide. 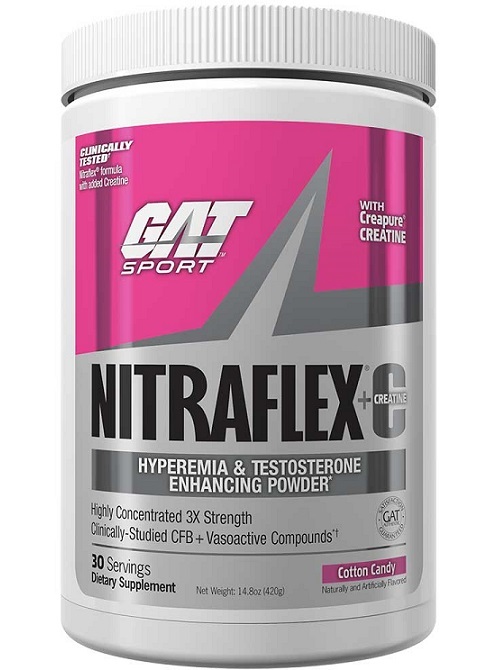 In addition to this, GAT Nitraflex + C contains Beta-Alanine, the amazing tingle-inducing amino acid, that not only tingles, but also supports Carnosine synthesis in the muscle cell. Carnosine buffers lactic acids and has a muscle-specific antioxidant effect. On top of all of these natural performance boosters, N-Acetyl-L-Tyrosine is in the mix, which passess through the blood brain barrier and supports the synthesis of neurotransmitters, such as dopamine, noradrenaline and adrenaline. These are important mood maximisers, which help us to feel satiated, motivated and optimistic. And to help smooth things over neurologically even more, L-Theanine has been added to the equation to offset some of the potential side-effects of caffeine, which is dosed at 325mg per scoop. L-Theanine ensures all of the energising effects of caffeine are still there, though without any jitteriness2. Together, these two nutrients help to induce "calm-energy". L-Theanine is a natural amino acid found in green tea alongside guess what other compound—caffeine. Important! - start with 1/2 scoop to assess your tolerance caffeine. On Training Days: If tolerated well, mix 1 scoop with 300ml water and consume 30 minutes before exercise. OTHER INGREDIENTS: Pineapple Fruit Powder, Citric Acid, Natural and Artificial Flvours, Silicon Dioxide, Calcium Silicate, Acesulfame Potassium, Sucralose, Beet Root Powder (colour).